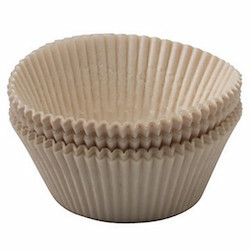 Muffin Baking Cups, Unbleached - 2-1/2"
These baking cups are made from premium quality, unbleached, grease-proof paper. Since no bleach is used to make them, these baking cups are least harmful to the environment. No chlorine is dumped into our lakes, rivers and streams. No need to grease the pan so additional fat and calories are spared and time is saved. This paper does not affect the taste of baked foods. The cups are oven safe and proof up to 428ºF. This set of paper baking cups is ideal for making cupcakes and muffins.